Knit or crochet a purse from a wool or wool blend yard, and then "full" it to shrink and felt it to the desired size. Fulling is the process of subjecting knitted, crocheted, or woven wool fabric to water and a little soap and then agitating it. This process turns the fabric into felt. You can also cut a purse pattern out of fulled fabric or handmade felt. Finally, with needle felting you can decorate a ready-made fabric purse or a knitted or crocheted purse. To full a knitted or crocheted purse, create the purse with big needles or a large hook. This will result in an oversized purse that will shrink to the desired size. Once you've completed the pattern, stabilize any openings by sewing them closed with a large whip stitch, which you will remove later. Add decorations or fasteners after fulling. You can full wool fabric in a top loading washing machine or by hand. It is best to use a top loading machine for fulling; front loading machines do not have sufficient agitation to felt the fabric. To full the purse in a washing machine, place the crocheted or knitted purse into the machine with some sheets or towels to increase friction on the purse. Set the machine for the lowest amount of water, add a small amount of detergent, and set the temperature to hot. Run the washer through a complete cycle. Check the purse to see if it is the size and texture desired. Repeat wash cycles until the purse looks the way you desire. Lay it out flat on towels to dry. Remove any stitches used to stabilize the purse. Add buttons, beads, or other decorations as desired. If you choose to full your piece by hand, the idea is basically the same; use lots of agitation and maximum friction. You can cut and sew fulled wool fabric or handmade felt fabric to create a purse. Handmade felt fabric is made by layering, wetting, and applying friction to carded wool or other animal fibers. Use a purse pattern to accommodate heavy fabric. Stitch and finish as directed in the pattern. Use sewing machine needles for denim or similar heavy fabrics. Apply decorations, fasteners, and straps or handles as desired. You can use needle felting to apply roving, or carded wool, to a purse, or you can use this process to attach embellishments made of felt fabric or created by knitting or crocheting. You can also needle felt a purse made of other materials; however, it will work best if the purse is made of a single layer of wool fabric. Transfer or draw the design you plan to needle felt onto the fabric or finished purse. On top of a foam sheet or other soft material, place a small piece of carded wool of the desired color. Use a felting needle, which is barbed, to turn the fibers into felt by moving the needle up and down through the fibers. As part of the felting process, the fibers will adhere to the base fabric. You can find many patterns for knit or crocheted purses you can felt, although there are more patterns for knitted purses and bags, than for crocheted purses. A few of the available patterns are listed below. Yarn company sites, such as Lion Brand or Caron, have a large number of patterns for purses. To make needle felting easy, especially if you are a beginner, you'll want to use simple designs. Any simple line drawing with well defined sections of color lends itself to needle felting. There are needle felting patterns on the web, but most are for needle felting three-dimensional objects instead of applying designs to a cloth surface. So, the easiest solution is to copy designs from coloring books and other sources of simplified line drawings. The process of felting purses is gaining in popularity, and it is becoming increasingly easy to find carded wool and other supplies to make felted purses. Whether you are a beginner or an expert, you can create colorful and useful purses using the various felting techniques. If you knit or crochet, felting (or fulling) adds yet another dimension to handmade purses. 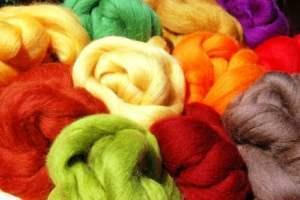 If you don't knit or crochet, you can create felt fabric for a purse or apply needle felting designs to a cloth purse.